I might as well be up front here: I missed a chunk of Trump’s speech and was only listening to the rest with half an ear. It struck me as a bog ordinary Trump speech, the only difference being that someone else wrote it and Trump stuck to the script. 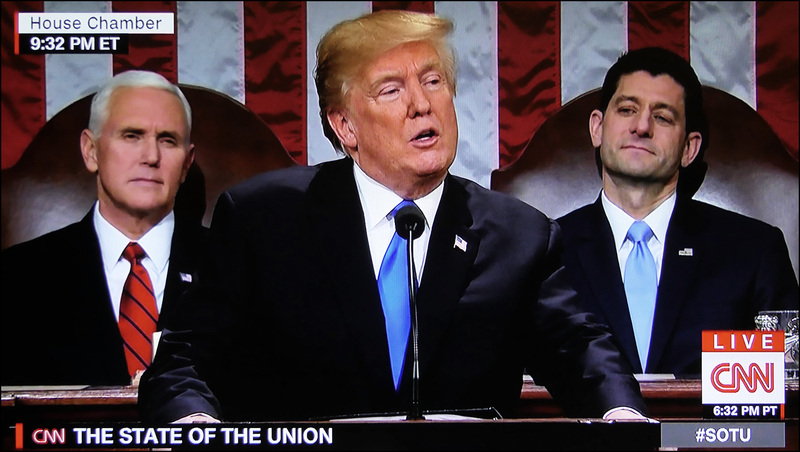 He interrupted the speech eight times to introduce a full 18 different American heroes, surely a record for a SOTU, and most the rest was just Trump boasting about how great America was after a year of Trump’s reign. Naturally there was some culture war stuff: standing for the national anthem, Americans are dreamers too, and the ranks of illegal immigrants are full of killers and gang thugs. Offhand, I can’t think of any truly new proposals for the coming year. Nothing but a few brief tough-guy platitudes about North Korea. Nothing about Afghanistan or Syria except for some bragging about how he single-handedly defeated ISIS. Nothing about Russia sanctions. Nothing much about veterans except that he supports them 100 percent. Nothing about opioids except that he’s against them. Nothing much about trade except that “the era of economic surrender is over.” Etc. So…it was OK. The culture war stuff is going to piss off a lot of people for no real gain. The rest of it sounded fine, and I’m sure most non-liberals were OK with it. The speech didn’t accomplish much, but neither did Trump make any mistakes. A transcript is here. 10:29 pm – Trump’s peroration is pretty good. It would be a lot better if I thought he believed a word of it. 10:19 pm – This whole speech is little more than a recap of all the stuff Trump has been talking about for the past year. It’s more like one of his rallies than a typical SOTU. 10:10 pm – Another heroic story. 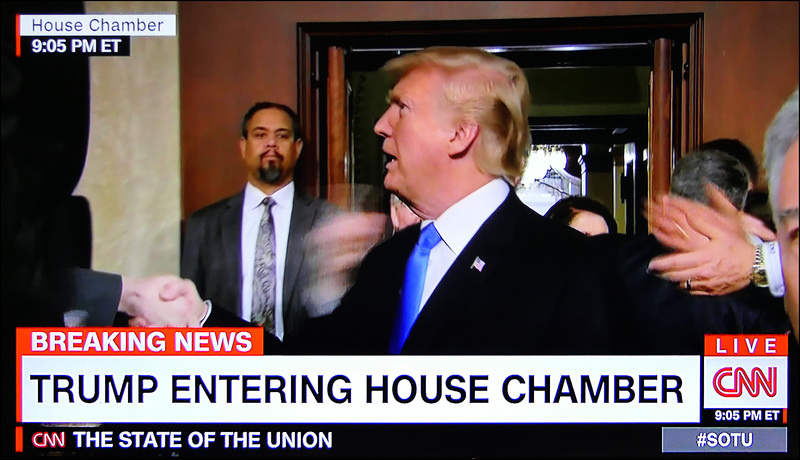 10:09 pm – Trump defeated ISIS in only one year! It’s a good thing he had a great plan from his predecessor that he could continue. 10:05 pm – How many stories of heroic Americans are we going to get tonight? I haven’t been counting, but it’s sure been a helluva lot more than usual. Is it impolite to think that there ought to be a limit to this stuff? 10:04 pm – Trump is dedicated to winning the opioid war. It would be nice if he put his money where his mouth is. 10:02 pm – Lotsa immigration stuff. Nothing new, though. 9:54 pm – “Americans are dreamers too.” FFS. Is this the 2018 version of “All lives matter”? 9:51 pm – Sorry, but I had to suddenly take care of something, so I’ve barely heard anything Trump said for the past 15 minutes. But has he talked at all about concrete proposals he wants Congress to take up? That’s usually what the SOTU is about. 9:36 pm – Clean coal! I swear, Trump thinks that the official name of everything that comes out of a coal mine. 9:28 pm – I have suddenly switched all the timestamps to Eastern time. Sorry about that. 9:23 pm – On the other hand, I’m not sure that wages are rising quite as strongly as Trump seems to think. Here’s the raw data. 9:22 pm – The economy is doing great blah blah blah. There’s not much point in fact checking this. Trump’s details might be off, but yes, the economy is doing fine. He said something about manufacturing jobs, but I didn’t quite catch it. Regardless, here’s the basic data showing the growth in manufacturing workers over the past few years. We currently have about 200,000 more manufacturing workers than we did a year ago, an increase of 1.6 percent. 9:05 pm – The president is in the house. 9:01 pm – As usual, the Secretary of Agriculture is our designated survivor. 8:58 pm – Melania Trump has made her first public appearance since the Stormy Daniels story broke. CNN reports that Melania arrived separately from Donald, but they will be departing together. ZOMG! 8:57 pm – What else? Marcy Wheeler reports that the Pentagon “has decided that the effort in Afghanistan is failing so badly that a complete lid must be placed on information that provides details that can be used to document that failure.” Surely that’s hyperbole? It’s true that the Defense Department’s inspector general has been reporting on various metrics of progress for the past couple of years. It’s also true that the Defense Department has told them that although the most recent numbers are unclassified, “they are not releasable to the public.” That is odd, isn’t it? But perhaps this is just part of Trump’s canny strategy of never letting the enemy know our plans? That must be it. 8:52 pm – So what’s going on while we wait for Donald Trump’s triumphant entrance? Let’s see. Howard Fineman reports that Trump is formulating a Plan B in case Robert Mueller doesn’t absolve him of all his sins. The plan is to “discredit the investigation and the FBI without officially removing the leadership.” Huh. That sounds like the current Plan A to me. So what’s Plan C? “Trump is even talking to friends about the possibility of asking Attorney General Jeff Sessions to consider prosecuting Mueller and his team.” Now that’s cooking with gas! Prosecute Mueller for having the gall to investigate Trump! I love it. 8:48 pm – The Trump motorcade is heading for the capitol! 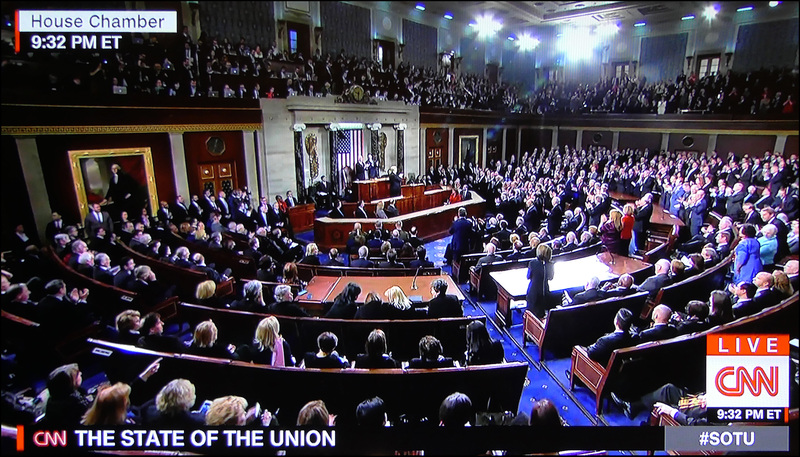 Since I made a big hoo-ha over the weekend about still being an old-school blogger blah blah blah, I guess I have to liveblog the State of the Union address tonight. I’m totally not up for this, but hey, this is what you guys pay me for. So come back around 9 pm Eastern and I’ll begin the snark.